If you are having a hard time placing older job-seekers, consider sending them to Canada. According to the 2010-2011 PwC (formerly, Pricewaterhouse Coopers) 14th Annual Global CEO Survey, “Canada was unique in the emphasis CEOs placed on older workers; 60% of CEOs in Canada stated that they had plans to make ‘some’ or ‘significant’ change to their people strategy to increasingly recruit and retain older employees, as compared to 42% of CEOs globally. PwC reports that this focus on older workers is in part explained by the challenges in hiring and keeping people under thirty. It notes that 75% of Canadian CEOs expect challenges in recruiting and integrating younger workers into their business, compared to just 54% of their global counterparts. Canada: Simply Nicer to Older People? Of course, Canadians are very nice and deservedly take pride in Canada’s social justice and equity policies that banish ageism from the arena of public practice, booting it into the hidden nooks and crannies of private, politically incorrect thought. So is that why older Canadian workers are being given a better shot at jobs? Or is the reason for the interest in older staff one or more of the following possibilities? Declining numbers of younger people, as a proportion of the working-age population? A shortage of sufficiently trained and experienced younger workers within their age cohort? Better service attitudes, work ethic and adaptability of older workers? Uncompetitive or unrealistic salary expectations of younger workers? A need for experienced and efficient job mentors to train younger, less-experienced staff? Older workers’ postponing retirement (out of economic necessity or other reasons), which means a de facto corporate “plan” to “retain” them? A proportional, comparable increase in older workers vis-à-vis younger ones that reflects expectations of similarly expanded hiring at other age-levels?—which suggests that increased interest in older workers is being driven, at least in part, by optimistic anticipation of across-the-age-board economic growth, rather than by a shift in lopsided age-group recruitment targets. Relatively more modest salary and benefit expectations and demands of older workers? Employment, linguistic or cultural challenges faced by younger more recently immigrated workers in immigration-dependent, multi-cultural Canada? For example, “…their average number of years of full-time experience in the labour market was particularly low. In 2004, recent immigrants reported on average half as many years of experience in the labour market as native-born Canadians of the same age group (7.7 years vs. 15.3 years)” (Human Resources and Skills Development Canada). Combining these data with the fact that the average age of working-age immigrants in Canada has dropped dramatically since the early 1990s, from 47.8 to 37.1, makes this hypothesis germane, if not also tempting. Logistical recruitment issues, e.g., younger-worker recruitment shortages or challenges due to their geographical mobility, travel and educational/existential moratoriums from work, and other forms of work hiatus? Clearer corporate recruitment strategies targeting older workers? In a scheduled Vancouver-Ottawa phone interview, I asked Ellen Corkery-Dooher, national People and Change leader, PwC, Ottawa, about these possible explanations. In her view, the principle verifiable reasons for the emerging focus on older workers are “the value of early-retired knowledge-based workers, shrinking younger age-cohort numbers and new business models that allow part-time, flexible and mentoring roles for older workers. Numerical age-group insufficiency relative to demand, i.e., a reflection of a purely demographic shortfall in numbers of available younger workers. This can be understood as a percentage of the total population or as a percentage of the actively job-seeking, job-holding or job-changing population. The full report says that Canadian CEOs are “less committed” to incentivizing younger workers, without delving into the reasons for that. However, Corkery-Dooher agreed that CEOs willing to incentivize younger workers need to consider the question of what kinds of changes would be appropriate. One puzzling aspect of the data available is this: In the PwC report, “limited supply of candidates with the right skills” is identified as the #1 concern of CEOs. If the recruitment of younger staff is thought to be especially difficult, why would only 38% of the Canadian CEOs surveyed be planning changes in incentives to attract them? Is it budgetary constraints, corporate philosophy, or a belief that such efforts are better directed elsewhere, e.g., recruitment of older workers, because of a greater probability or degree of success, in turn because of insufficient numbers or motivation within the younger groups? Clearly, if the recruitment of younger workers were not difficult, incentivizing efforts would not be necessary. But this seems neither to be the case nor the reason for the dearth of such corporate efforts. Equally puzzling is the question of why Canadian CEOs would be especially challenged in trying to figure it out? Are there no other national models to adopt or adapt? Are others abroad better at figuring it out? Addressing the question whether, despite the paucity of younger-worker incentivizing efforts or the possible, comparable expansion of hiring of younger workers is in the offing, Corkery-Dooher said that she has no data available suggesting this, leaving open the question as to whether or not the expanded hiring plans for older workers is, at least in part, a reflection of a generally stronger Canadian economy—compared with other nations or with its own recent performance, despite indications she mentions suggesting such an overall strengthening of the Canadian economy. Evidence for this latter conjecture can be found in the same PwC report: “Overall, more than 60% of Canadian CEOs are expecting to add jobs over the next year, outpacing the global average of 51%.” And this: “Only 20% of Canadian CEOs said they were planning to grow their contingent workforce faster than their full-time workforce, compared to 32% of CEOs globally.”—further evidence of Canadian optimism and strong projected economic performance. Corkery-Dooher underscores this point herself: “With confidence in revenue growth starting to return, this could mean more Canadian companies hiring more full-time staff, rather than supplementing their workforce with casual, contingent employees. It may be that special incentives are required to attract from the pool of demographically scarce younger workers those who are available, rather than such incentives being required to motivate young people who are numerically plentiful enough, but simply not interested in what is being offered. Accordingly, it would be important to distinguish planned changes in incentivizing strategies predicated on assumptions of a simple numerical shortfall from those based on the motivational disinclination of younger workers. The reason this distinction is important is that if the recruiting impediment is motivational rather than demographic, any increase in the numbers of potential young workers would not assure a corresponding increase in the economic supply of them—in terms of their willingness to supply their labor at perhaps a lower level of compensation (in virtue of being so numerous relative to available jobs). Hence, any incentivizing strategy that conflated these two concepts and population pools would, over time, be vulnerable to a serious miscalculation should the age-cohort size increase (as a percentage or in absolute numbers) without a matching increase in the willingness to accept a given job package. In our interview, Corkery-Dooher quashed any suggestion that older workers are somehow better motivated than younger ones. As she put it, with regard to any imagined age-group differences in work ethic or professional dedication, “same fervor, different flavor”—an allusion to differences in preferred work style, rather than to differences in work readiness. In keeping with this perspective, she also disavowed any notion that one or the other age group has become “preferred”. Turning the foregoing Canadian hiring projection on its head, it is worth asking whether the substantially lower 42% global average planned hiring figure for older workers mentioned above reflects a weaker demand for older workers abroad and/or a bigger demographic supply of younger workers or smaller supply of older ones in other countries (whose smaller numbers of older workers may generate recruiting diseconomies of smaller scale in chasing after them). Obviously, developing economies that are not aging as rapidly as those of Canada, Japan, Italy, China, etc., will have neither a numerical shortfall of younger workers nor have comparable challenges in motivating them to take the available jobs. On the other hand, despite China’s challenge of an aging population—the result of the 1-child policy, a CEO or recruiter in China is unlikely to be saddled with incentivizing challenges. That’s because China has far more fresh post-secondary graduates than jobs, with, for example, 25% of the 6.5 million graduates being unable to find any employment after graduating in 2010 (800,000 of those who graduated the year before were still looking in mid-2010) and many of the remainder scrambling for whatever jobs and housing in “ant tribes” they could find, often at low wages comparable to the subsistence-level income of a migrant worker). The 25% unemployment rate is endured by not only recent graduates—including the 30% who graduated from “prestigious universities”, but also among all college graduates in China, according to one report. Worse, in addition to being depressed by the scarcity of jobs, these graduates are vying for wages that are depressed by the graduates’ sheer numbers in a tight market that some are predicting will become tighter as policies shift from job creation to greater worker productivity and efficiency. So, all things considered, if you are neither older nor working in Canada, you may want to give some thought to the latter, given that you will eventually become the former. 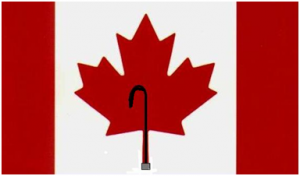 That’s because given the PwC report, for an older worker already in Canada, “Yes, we Canada!” is as certain to be as true as the true north and a promise as good as Klondike gold and one’s dreams of the golden years of life…. …the promise that not only can the Canadian older worker do the job, but also that he can get it.